The NBA-worst Philadelphia 76ers lost their leading scorer and rebounder to injury Friday when it was announced that rookie center Jahlil Okafor will miss the remainder of the season to undergo surgery to repair a small meniscus tear in his right knee. The news does not greatly affect an organization that would love to finish with the highest odds of winning the No. 1 pick at the draft lottery. However, it does serve as an occasion to reflect on Okafor's very up-and-down first NBA season and what the future could hold for him and his club. Meniscus tears have derailed or stalled careers before, but that typically only happens when a player opts to play through the pain instead of opting for surgery. Okafor's decision is a no-brainer given the low stakes of this Sixers season, his age, and his potential moving forward. Okafor had been playing particularly well on the heels of the NBA All-Star break. In the Sixers’ first six games back, Okafor averaged 20.3 points in just 26.6 minutes per game Over the course of this span, his offensive rating was 115.0, while he converted 63.4 percent of his field goal attempts. The article quite glaringly does not discuss the early-season controversies that led the Sixers to suspend Okafor for two games, which would seem to be a major event of his rookie season. On the other hand, Okafor did seem to be a more dependable player after these high-profile issues, so perhaps it's better to consider them as failures to be transcended and not outright warning signs. That's not to say that the Sixers should be sure of Okafor's fit. The Sixers.com piece notes his high ranking among rookies in traditional big-man categories such as points per game and field-goal percentage, but he did not accomplish those numbers in a vacuum. Okafor was a popular preseason Rookie of the Year selection because it was clear the Sixers would give him every opportunity to serve as the focal point of the offense. The stats he put up this season were mostly impressive but also largely expected. 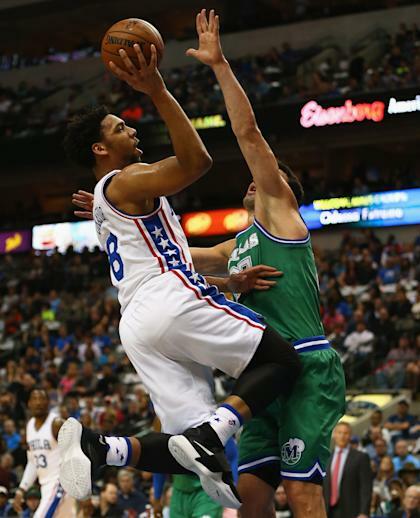 At the same time, many of the concerns about Okafor proved to be correct. His defense needs lots of work, to the point where he essentially needs to be played with a power forward who can guard bigger players effectively. Yet such players typically need to occupy the same offensive zones as Okafor, which budding defensive ace Nerlens Noel learned the hard way this season. The 2015-16 Sixers' two highest-potential players cannot play together with much success, and it's hard to see how many players in the league could pair with Okafor effectively. Anthony Davis and Serge Ibaka are rare talents for a reason. None of this is really Okafor's fault, but it's now conventional wisdom that any team who employs him will have to work around his weaknesses with keen awareness. The Sixers picked the player most people thought was the best available at No. 3 last June (even if it turned out Kristaps Porzingis would have made much more sense) and have seen him play well enough to inspire confidence. Unfortunately, he's not any closer to carving out a clear role with the team. With Croatian forward Dario Saric, a maybe-sorta healthy Joel Embiid, and potentially one more high-value frontcourt rookie (top prospects Ben Simmons and Brandon Ingram are forwards) set to join the club next season, it's possible that even more players will have to work around Okafor. Trade deadline rumors surrounding his future provide some basis for an increasingly reasonable conclusion — that the Sixers and Okafor could be better off with a trade. His value isn't clear, but it could be best if he ends up with a team more willing and able to work around his flaws. For better and worse, the Sixers appear too focused on accumulating talent to trouble themselves with the specific needs of any one player.